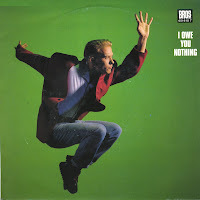 I recently wrote about Bros' 1988 single 'I owe you nothing' and the fact that it was originally released a year earlier. What I didn't know was that this original release came in a different sleeve. I found that single and decided to buy it right away. So I bought it because of the sleeve, but much to my surprise, the version on this single is also different from the one on the 1988 single. So this really is the original version of 'I owe you nothing'. 'When will I be famous?' 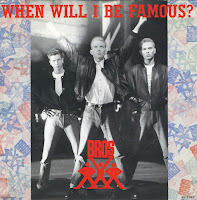 was the second single by Bros, released in November 1987. 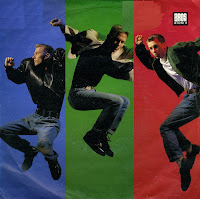 The single became a huge success, launching Bros as the new boyband hype of the Eighties. The song reached number 2 in the UK singles chart and number 6 in the Dutch Top 40. I wrote about 'I owe you nothing' once before, as I already owned the single for a long time. But this weekend, I managed to find three more copies of the single. Three more? Yes, because the single was actually released with four different sleeves. 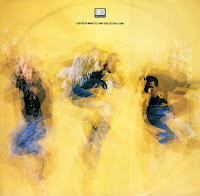 One was a compilation of the three others, featuring one member on the front sleeve each. 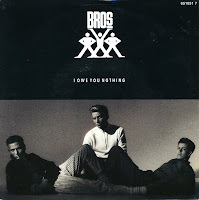 Such was the popularity of Bros, that the single was not only released this way in the UK, but also in Europe. 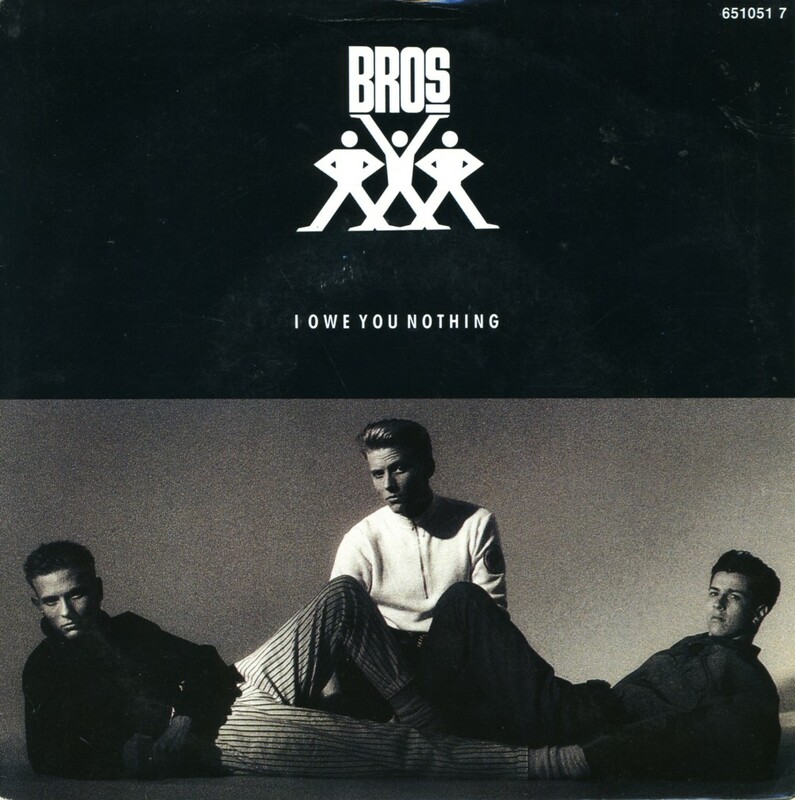 When 'I owe you nothing' was released as Bros's debut single a year earlier, it failed to chart. The re-release was much more successful, as it managed to climb to the top of the UK singles chart this time around. In the Dutch Top 40, the single reached number 4. Finding these singles - the German pressings of them, by the way - saw me confronted with an administrative question: would I catalogue them as three separate singles? In the end, I decided to give them all the number 4162. After all, all three singles contain the same two tracks. 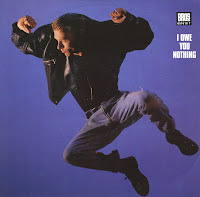 Originally released as their debut single in 1987, 'I owe you nothing' flopped. After the success of their breakthrough single 'When will I be famous?' it was re-released. It was accepted by the teenage audience as Bros mania was at its height. The single became the band's only UK number one, spending two weeks at the top in June 1988. While the band ever broke through in America, the single did make number 10 on the Billboard dance chart. The single was also released as a lengthy 18 minute dance mix on a special 12" single. I never understand the Bros-mania that took the UK by storm in 1987. They weren't so special, these two brothers Matt and Luke Goss and one friend, Craig Logan. Their debut album 'Push' was released in early 1988 and the record company milked it for all its worth, releasing single after single because the young people who were so wild about them would just about buy anything anyway. I bought 'I quit' after it ended up in the discount bin after a relatively disappointing chart run in the Netherlands, reaching only number 33. The nice thing about this single was the extra inner sleeve. For a year or two, Bros was the hottest pop band in the UK. Their popularity was indescribable. Young girls were spending fortunes on Bros records and memorabilia. Their music was catchy, lead singer Matt Goss had a voice that resembled Michael Jackson sometimes. 'I owe you nothing' was the most energetic song of their only successful album, 'Push'. 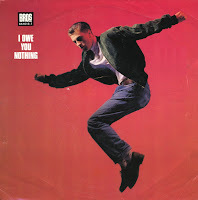 As was customary in those days, the single 'I owe you nothing' was released in a multitude of formats. 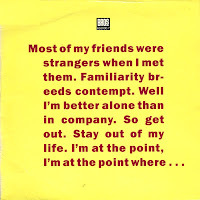 There were three different sleeves for the 7" single (each featuring a different band member) and there were various 12" singles with different remixes on them. From those, the 'Over 18 mix' was the most interesting. Shep Pettibone, Ric Wake, Nicky Graham, Gary Crowley and Steve Shin collaborated to create a remix of the track that lasted for 18 minutes and 1 second. It's worth a spin - if you have the time. The B-side groove of this 12" looked very interesting, but the sound included, as the title suggested, 'Nothing'.